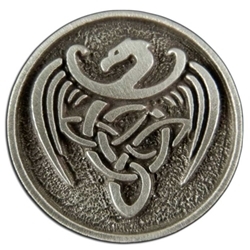 Our Celtic Dragon Button is made in fine pewter. It measures 1 inch in diameter. Our Celtic Dragon Button is made from lead free pewter in the USA. This button is the perfect edition to add the finishing touch to a medieval, renaissance or Irish garment. It has a shank on the back of the button to securely attach it to your garment by sewing it on. This is a single button.